Having successfully completed the college selection process with offspring one (and hoping all the scars will heal), I find myself the parent of one soon to be calling Hartford, Conn her home. My brother, of Albany, NY environs, when asked about food in Connecticut sneered - there is no good food. We know this is not true. So I set out for Hartford, with the thought of trying some pizza to start. I seem to recall some discussions on New Haven pizza, and asked for that. What is New Haven Pizza? We were sent to Pappa's, down by the old train station in Hartford. A pleasant dive with tile floor, formica tables, fluorescent lights, a wide-ranging menu with some interesting choices, and a historical mural on the wall. We ordered a mediocre greek salad, flooded with the cheapest feta cheese I have ever experienced, and a small pizza. The style was similar in most respects to Home Run Inn, to my surprise, though of better quality overall than my most recent visits to Home Run Inn. 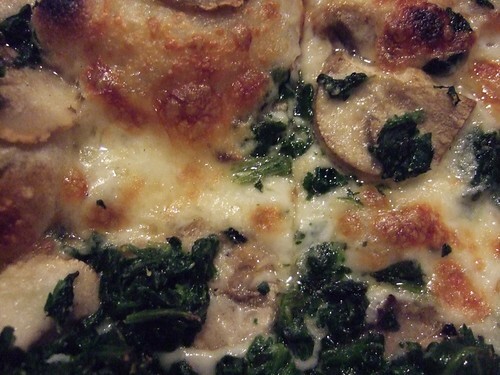 Medium buttery and slightly chewy crust, lots of cheese and slightly tangy sauce. Is this New Haven style? Since I expect to go back to Hartford a few times, I would appreciate any recommendations you might have for future dining. We also visited a couple of other spots around Albany, but for clarity I will put those in a separate post. Medium buttery and slightly chewy crust, lots of cheese and slightly tangy sauce. Is this New Haven style? Well, it's not at all like HRI pizza with its very "short" crust to use a term that has context here. In terms of the basic form, it really is most similar to Piece here in Chicago. I don't know Hartford, but I haven't ever heard it lauded for much, food-wise, including New Haven style pizza. I doubt that you can get the kind of pizza that New Haven is famous for in Hartford. New Haven's reputation is really based on two pizza places, Sallys and Peppys, which are a block or so away from each other in what was, historically, the Italian section of town. (For some "hilarious" (read offensive) send-ups of Italians by the priviledged students at Yale, see the classic "Stover at Yale.") Both places serve crisp thin-crusted pizzas made in wood-fired traditional pizza ovens, quite different (and better, in my opinion, but let's not get into that) from anything you can get here in Chicago. My personal favorite was the white clam pizza from Sallys, though Peppy's version was awfully good too. There are now other good pizza places in New Haven, some of which have the ovens too, and at most you can get a good slice. There's other good Italian food to be had in New Haven as well -- calzones, for instance. 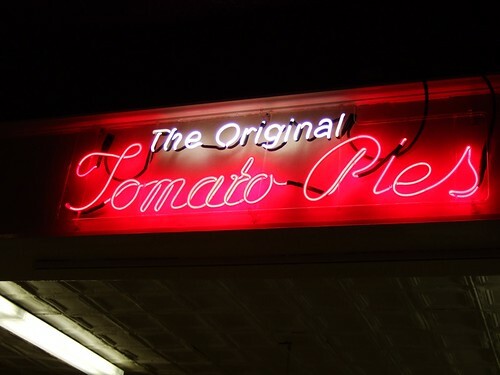 And, for Connecticut food generally that differs from here, there are nice places to eat on the shore -- I remember fondly a roadside place called Lenny's By the Sea, where one could get a big bucket of steamers and a lobster for under $10 -- of course, that was back in the mid 1980s. I'm not even sure it's still there, but there must be other places to snag some good shellfish. Yeah, I was thinking it was more an Italian-style pizza, puffy and crusty, so Pappa's was a surprise to me. Disappointed to hear confirmation that there is no good food in Hartford. Someone, please, prove that wrong. If not, I will make that search my personal mission. ToniG wrote: Both places serve crisp thin-crusted pizzas made in wood-fired traditional pizza ovens, quite different (and better, in my opinion, but let's not get into that) from anything you can get here in Chicago. You meant to instead say, "coal-fired," right? Disksond: I have nothing to say about the pizza (although I ate at Peppy's a few months ago and it was awesome), but as the father of a college freshman and twin juniors, I feel your pain and pride in college admission process. I spent the weekend visiting the girlfriend in CT. When we awoke on Saturday morning I mentioned that through LTH I have learned that there is not muchn in CT other than New Haven pizza foodwise. She agreed and promptly began driving the short 20 minutes to her standby pie shop, Modern Pizza. Our pizza outing was followed by touristy things that she hadn't done since her youth. Foodwise all I can mention is the chai tea enjoyed while walking the boardwalk in Mystic. Additionally, we had the most miserable meal of our lives at a place called Cherrystone's in Old Lyme. Cherystone's is a smallish place with a basic menu. Awful food, worse service (Need I say more?). My trip finished with a late lunch/ early dinner with the g'friends parents at a microbrew chain named Hop's. To my surprise the food was decent, not anything to write home about, but satisfying. The highest praise I can give them is for their croissants. These butter bombs are served straight out of the oven drizzled with a honey glaze. Light and airy I could have devoured dozens of these things. While talking with the locals itis pretty clear that even they agree that there is not much going on in the restaurant scene. In fact, most of them get excited when one of the new chains opens a place. I'll visit again soon even more determined to find a decent bite to eat. i can't say i've ever been to new haven, but Piece Pizza in wicker park has what they call new haven style pizza.. how authentic it is, i don't know.. but it is good pizza, a good atmosphere... they also have their own microbrews. Having grown up in Chicago and gone to college in New Haven, I have been spolied by great pizza all my life. That is, until I moved to San Francisco, where the pizza is worse than Domino's or Pizza Hut. I'm not kidding! New Haven pizza is a godsend, and I'm curious to try Piece next time I'm back in Chicago. But the real deal is in New Haven. 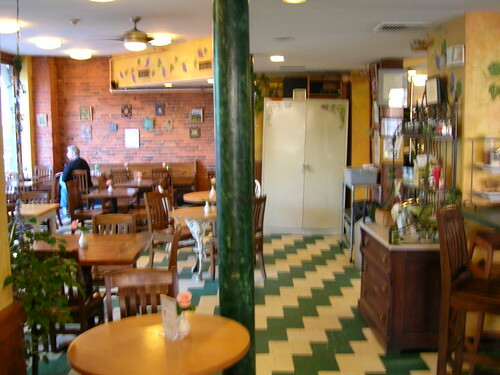 As people mentioned, Pepe's and Sally's are the classic places to go, but they can be crowded. I prefer Pepe's because the pizza is a little less blackened, and they serve Foxon Park sodas, a local brand of soft drink bottled in neighboring East Haven. Try the birch beer. 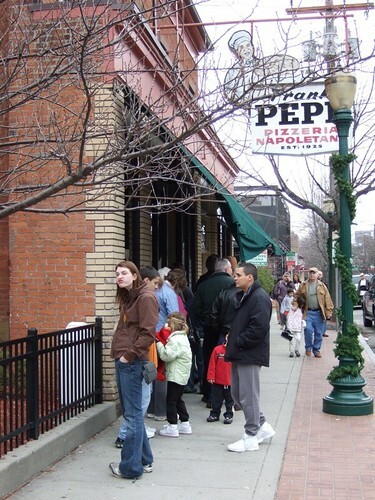 Being the originals and the most popular, there is frequently a line at both Pepe's and Sally's. Few people know that The Spot, located in the back of the parking lot next door to Pepe's, serves the same Pepe's pizza to people who don't want to wait. Another good option if you don't want to stand in line and you're on Wooster Street is Abate, just down the block from Pepe's. After your pizza, stop by Libby's Italian Pastry Shop (between Pepe's and Abate) for good cannoli and Italian ice. The place is a real hoot. This weekend I am travelling to New Haven for a wedding. I've already informed the gf if she wants me to help her fix some items in her house that she will be bringing me back to Modern for a pizza fix. This time I will go with my gut and order a minimal of toppings. I'm happy to know that someone else enjoys this place. In the words of Joe Lieberman, "I've known Pepe's, and Piece, you're no Pepe's." Piece isn't bad, but it's not nearly as good as Pepe's (the only New Haven place I've tried). Another place much enjoyed during my years in New Haven (a while ago to be sure) was Naples Pizza on Wall Street, which was very much the Yale hangout, and I ate many meals there, breakfast, lunch and dinner. I certainly hope it's still there. Breakfast was good for evesdropping on Yale profs on whatever subject they might be holding forth on -- in my day I was privileged to be able to listen in on Henry Louis Gates (since departed to Harvard) and his colleagues, who ate breakfast there every day. My husband and I always really liked the pizza at Naples, which you can get by the slice, so there's your lunch and dinner. We ate there lots because when we were there as grad students we were both doing much work for the clerical workers' union, then out on strike and supported by the maintenance workers -- so no crossing the picket lines to eat in the dining halls (which were shut down anyway), or even attending classes in the buildings -- but many lively discussions were had in the local restaurants, that's for sure. If you do drop in to Naples, let me know if the pizza is still good. I just spoke with the gf and she says that Naples is still around and churning out a good pizza. However, she claims that it is not a traditional New Haven style. In her opinion it's more greek. I don't think that this is a bad thing, just another opinion. Either way I'm eating pizza for lunch on Friday. Thanks for the update. No, Naples didn't serve the signature New Haven pizza, but was still better than anything I've had here, I'd say. Also, no lines and available by the slice, and on the Yale campus, hence its popularity. Have a great time! We have now decided to visit Naples for lunch and stop by Libby's for pastries and italian ice afterwards. I'll report back. Swell, I'll be anxious to hear how it all goes. 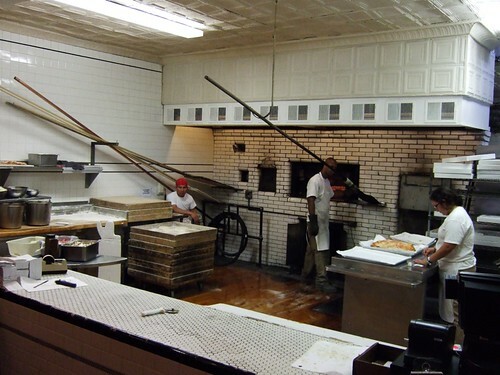 To this day my New Haven friends will break out in a warm grin at a mention of the phrase "Slices are Ready," which would bring 5 or 6 people to the counter at Naples. Modern is fine but I'd strongly suggest a visit to Pepe's (my preference) or Sally's. I've had some very good pizza at Modern, but best was not really that close to best at the other two places. Naples is a good time but I always thought the pizza was good but not much beyond. Please, it would be a crime to be so close and not go to Pepe's and get a white clam. 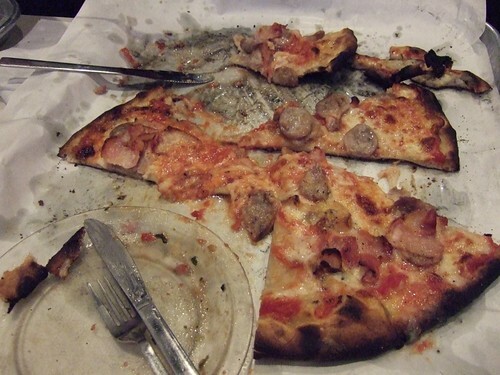 If this is your sole New Haven pizza meal, DO NOT WASTE IT AT NAPLES! 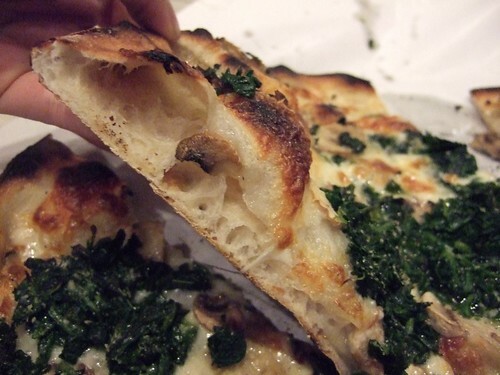 The pizza is merely acceptable (for New Haven, that is. If Naples were in San Francisco, I'd die). And it's not particularly Greek-style. It's just sort of, well, undistinguished. For Greek style pizza, try Yorkside on York Street, or even better, Pizza House at the corner of Edgewood and Howe. I graduated from Yale in 2003, and spent a good chunk of time at Naples. During my time in New Haven, Naples remodeld its interior (now it's pastel) and lost their liquor license (The main reason to go to Naples was because they served EVERYONE. Thursday night was freshman night). Majorly disappointing. But I think they may have gotten it back since then. The Romance languages departments were right upstairs from the restaurant, and I remember having oral exams in there for my Portuguese classes! Visit Naples for nostalgia only. For food, go elsewhere. Other things worth eating in New Haven include: Yankee Doodle on Broadway. Killer egg sandwiches and butter-topped burgers. Good shakes. Also Louis' Lunch on Crown Street. They claim to have invented the hamburger. Get it with cheese and onions, and like in Chicago, don't ask for ketchup! Well, I have returned. I had not been able to read the previous mentions of Naples before my visit to CT, but I don't think they would have changed the destination. Here's what I discovered. Upon entering we walked into what appeared to be a small bistro type spot with small tables and a small counter. After walking past this room we came to the pizza counter. There we were offered slices of premade pies, but opted to order one large sausage, and a medium veggie. Our group of 4 tried to order a pitcher of the amber brew on tap, but could only be served by the glass. The Pizza at Naples is what Domino's could be if they used real sausage good cheese, and fresh tasting tomatoes instead of an annoyingly sweet sauce. The crust had a definite crispness on the bottom, but maintained a good chew. The sauce, was not so much a sauce, but a light touch of crushed tomatoes balancing the combination of the whole pie. The cheese and sasauge, while not the best I've ever had, were quite servicable. Overall, I did prefer my visit to Modern a bit more, but I will have to visite Pepe's or Sally's on my next visit in three weeks. We did venture over to Libby's for a canoli and lemon ice. The canoli was good as described, but I found the italian ice to be one of the most refreshing items I've enjoyed in a long time, Pleasantly tart and satisfying. It appeared that Pepe's was closed as we drove past on our way to Libby's I found this unusual since we were there around 2:30 on the First Friday of lent, and had been told of the famous clam pie. If they had appeared to be open I definitely would have stopped in for a sample. I'll continue with my research of New Haven style pizza during my upcoming visits. For histories sake next visit will also inclued a visit to Louies Lunch for a burger. Returning to the subject of food around the delightful burgh of Hartford, my one recommendation is Rein's New York Style Deli. It is up 84, around exit 65 - Vernon CT -- right off the main drag, in a strip mall. I have been stopping there on road trips between Boston and NYC since as long as I can remember. It is one of the better dining destinations in the area. Decent knishes, passable pastrami, a light, fluffy matzoh ball, and very very good pickles. They've got nova and chubs and all kinds of candy. Restrooms (aka "Flushing") are labeled "Menhatten" and "Queens". A must-stop during road trips, and for you, most likely a must stop during college visits. They even serve tongue. Alas, the planets did not align to permit even a taste of New Haven Pizza. A flat tire got us to New Haven too late for pizza, and because Sally's and Pepe's are only open for dinner, we could not remedy the situation the next day. Nevertheless, we enjoyed a nice brunch at Claire's Cornercopia, a granola-set breakfast and lunch place centrally located and a short walk from the admissions office. Here is a phograph of the menu board. Claire herself was there to take our orders and make us feel welcome. 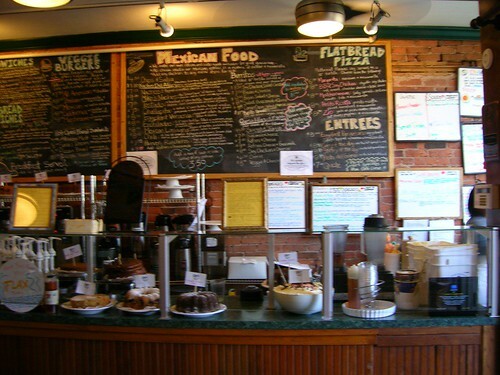 We had a hard time ordering in spite of her attentions, because the fine array of baked goods was hard to resist. So we decided not to try. Nevertheless, some protein was in order, due to the day's rigorous schedule. 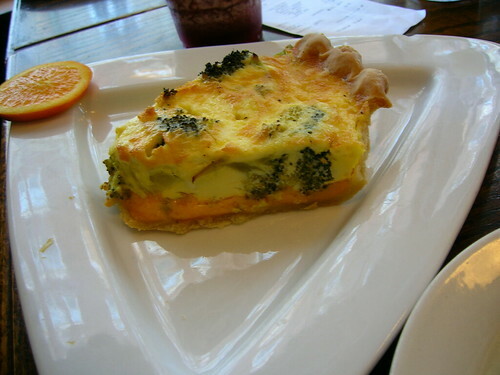 My daughter pronounced the texture of her quiche to be "silky,"
while I was very statisfied with their Italian Farmer's Breakfast. 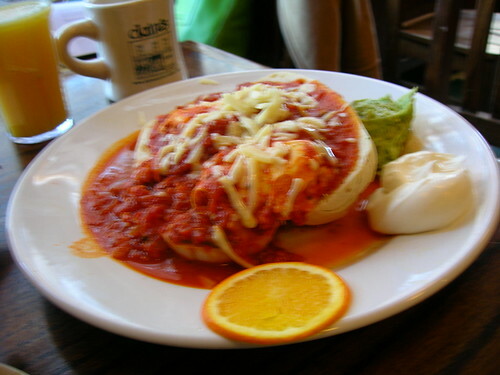 The Italian Farmer's Breakfast was a poached egg in tomato sauce with mozzarella over Italian bread. My only quibble was with the merely-warm tomato sauce, which needed some seasoning as well. It's pretty clear that the loss of pizza opportunites must have been on my mind when I chose that dish. Nevertheless, it was a solid meal, and why forego dessert? 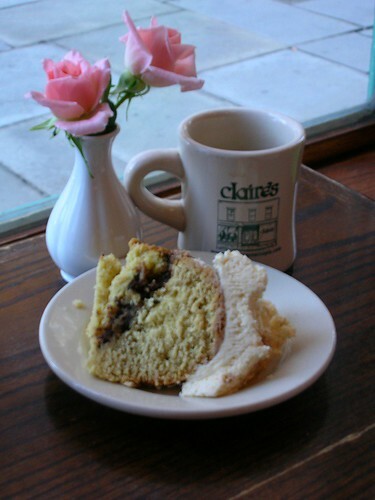 We chose a slice of the Lithuanian coffee cake. A bit later, when we arrived at the tour departure point, I was glad that my daughter and I had something in our stomachs, since the sight that greeted us made us both a bit queasy. Standing just in front of the fireplace there was Yale's actual mascot from an earlier era, a bulldog with a name like "Old Spike" who had been stuffed and encased in glass for applicants and tourists alike. Very creepy. But hey, it worked for Lenin. Bummer about the flat tire! Hopefully you will be able to get back to New Haven to try again. It would be worth the trip just to get a white clam pizza at Pepe's. I'm not sure if anyone has mentioned Louis Lunch as another "not to be missed" place in New Haven. Just off the Yale campus, they claim to have invented the hamburger. They still use the original vertical cast iron gas grills to cook the burgers. I must say I was very disappointed with Pepe's pizza about a month ago. It was decent, I'll admit. But for a place constantly on nation-wide top ten lists, it really falls short (and I've tried quite a few places that make those standard top ten lists we see all the time. Some I like better than others but all seem to rise above the rest in at least one or two ways. Pepe's?). First, off, no fresh clams available so no clam pie. I know that's what they are known for but supposedly their regular pizza is to die for also. Lots of cheese and not very good cheese at that. When I saw them making pizzas when I walked in my first thought was, "damn, thats the coolest oven I've ever seen." My second thought was, "why are they laying layer upon layer of sliced, aged mozzerella on the pizza without any sauce." Well, that turns out to be the standard pizza. There's a little sauce and it's not bad in flavor but it's overshadowed by gobs and gobs of sub-par aged mozzerella. The crust is expertly cooked with proper char marks on the bottom. However, it even lacks something. Now, would I take it over any of the NY-style thin crust places in Chicago? Sure. It's probably still better than two thirds of the places in New York. That still leaves hundreds of places better, though. This is clearly an example of a place coasting on reputation. I noticed that they have 2 or 3 other locations now. It appears maybe money is getting in the way of quality now. The day I was up there Sally's was closed so I plan on making another trip and if clams are available I'll try Pepe's clam pie then as well. Anyway, I will be in Hartford again this weekend and will try to post a report, probably in a new thread focused on Hartford since this has turned into a New Haven thread (which makes sense to me) on what I have found. There is a pretty good Afghan spot whose name escapes me, and I have my eye on a Portugese place for this weekend, as well as a couple of seafood places. One good pizza place in the Hartford area is Luna Pizza on Farmington Avenue in West Hartford. They serve excellent NY-style pizza on those trays that have their own stand (like Grimaldi's in Brooklyn does). Not quite at the level of Pepe's or Grimaldi's, but really good if you are in the area. As promised, there was a line at lunch on a Saturday. It moved pretty fast-that is, compared to Walker Brothers in Wilmette on a Sunday morning. My daughter ordered spinach and mushroom. My brother went for the "all meat,"
sausage, pepperoni, and bacon. I couldn't sell the clam idea. I believe that Pepe's is considered "thin crust," however, as this picture shows, the thickness varies. I liked the yeast-bread qualities of this crust quite a bit. The aftermath of the all meat pizza. It's a bit gory, don't you think? Neon sign at Frank Pepe Pizzeria Napoletana, Manchester, CT.
Queijo wrote: Returning to the subject of food around the delightful burgh of Hartford, my one recommendation is Rein's New York Style Deli. It is up 84, around exit 65 - Vernon CT -- right off the main drag, in a strip mall. I have been stopping there on road trips between Boston and NYC since as long as I can remember. It is one of the better dining destinations in the area. Decent knishes, passable pastrami, a light, fluffy matzoh ball, and very very good pickles. They've got nova and chubs and all kinds of candy. Restrooms (aka "Flushing") are labeled "Menhatten" and "Queens". A must-stop during road trips, and for you, most likely a must stop during college visits. They even serve tongue. Queijo - I have the very good fortune to eat at Rein's frequently. You are in good company. It seems that lots of travelers have discovered this stop between NY and Boston. They are open early and late and attract quite a few UConn students. Peak times are weekends, when there can be lines. There are usually a couple of seats at the counter. They recently opened an outpost in Springfield, Mass., though I have not eaten there. 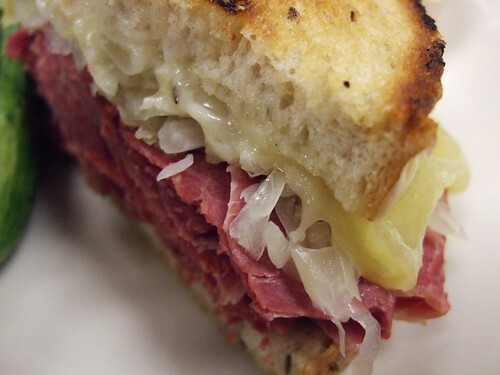 Here is a picture of their standard Reuben. They also have a Fresser version with more meat, but I like their standard ratio of sauerkraut and swiss to corned beef. Rein's has a really good chicken pot pie in the freezer section, along with soups, kugel, cheesecake, and all the usual items. 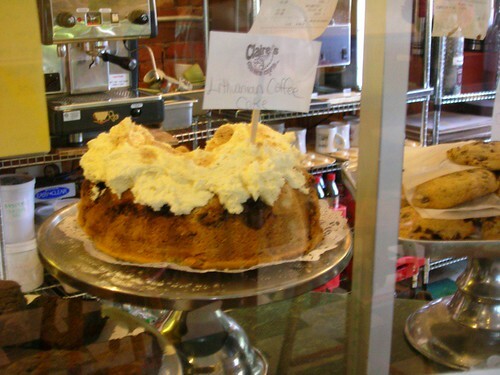 They make their own pies and sour cream coffee cake which are quite good as well. i'm suprised to find no comments on white pizza vs various other sauces. this is always a debate we have when ordering Piece, which we prefer better. sometimes with piece i just gotta go w/ red, their white pizzas sometimes feel lacking..
but in new haven... you have to have a white clam pizza. sensational. try a white clam and bacon and you'll be craving it for months. you can get this at piece too, but the clams just aren't fresh (or if they are, maybe they're overcooked? who knows... something about them isn't the same). and any time i order this at piece i always walk out paying more than i would for a deep dish pizza elsewhere.